Could pond scum be causing your chronic Lyme symptoms? You may be surprised at the answer. Pond scum—that thin layer of scum that grows on rocks and surface waters—is actually caused by bacteria that form “biofilms.” Biofilms are the topic of a great deal of recent unpublicized scientific research. Even more recent research suggests that biofilms might help explain why Lyme disease and other cryptic diseases are so difficult to cure. JW Costerton is a bacteriology expert from Canada. Posthumously, colleagues have called him the Father of Biofilms for his pioneering research on biofilms. According to Costerton, publishing in a recent work, biofilms live in “polymicrobial” communities. That is, they are made up of many different species of bacteria and fungi, not just one. These microbes provide each other with the traits that they can’t provide for themselves, Costerton explains. It’s like a little family, perhaps the most primitive kind of family, and scientists are only in the past decade or so becoming aware of their importance in our food, environment, and health. Costerton first implicated biofilms in human infections in the 1980s, when he hypothesized in an October 1984 article that one of the most common bacteria on earth, P. aeruginosa, forms biofilms by attaching itself to inert or solid tissue surfaces, thus causing infection. 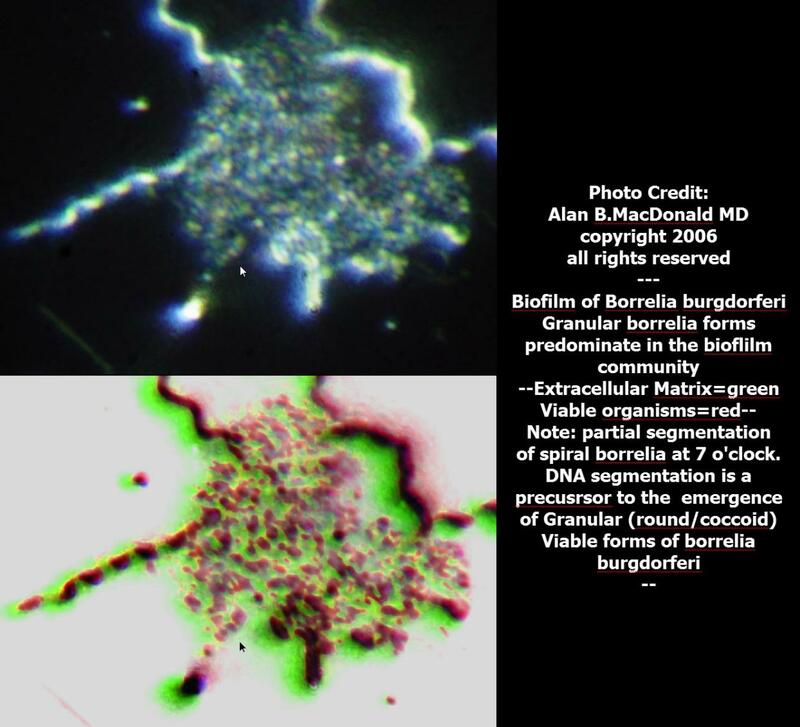 Costerton found biofilms formed by this and other bacteria in patients suffering from pneumonia and cystic fibrosis. Alan MacDonald , a research assistant at the University of New Haven and long-time pathologist at St. Catherine of Siena Medical Center believes biofilms may also be the culprit behind another still-mysterious disease: Alzheimer’s. Alzheimer’s causes a previously unexplained symptom called Alzheimer’s plaques in the brain. Pathologists use microscopes and imaging to identify such symptoms and help diagnose Alzheimer’s. 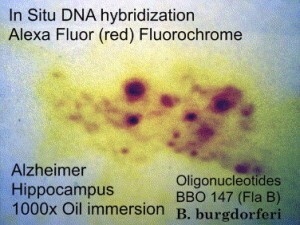 According to MacDonald, these plaques, which are rich in Borrelia may in fact be biofilms. If experts such as Costerton and MacDonald are right, 14 million people per year in the US may be victims of biofilm infections. As Dr. Costerton explains in a recent video interview, many infections are not adequately treated. MacDonald agrees, as he explains on his website. Biofilms may also be implicated in the contamination of food supplies. In 2013, Virginia Tech researcher Monica Ponder found that salmonella, a bacterium that causes food-borne illnesses, can form biofilms that allow it to travel through the food chain “tightly adhered to whole spices.” The University recently highlighted her groundbreaking work in an article online. Legionella, a deadly bacteria of recent identification, has also been found as a biofilm in water storage tanks. 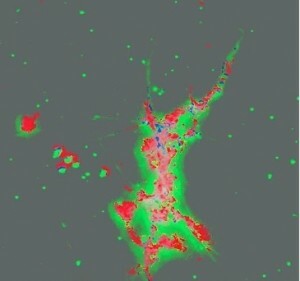 Striking photographs captured by researchers published in 2012 in FEMS Immunology And Medical Microbiology, a scientific journal, and shown below, picture these communities of microbes surrounded by the defanged cells of our immune system called leukocytes. 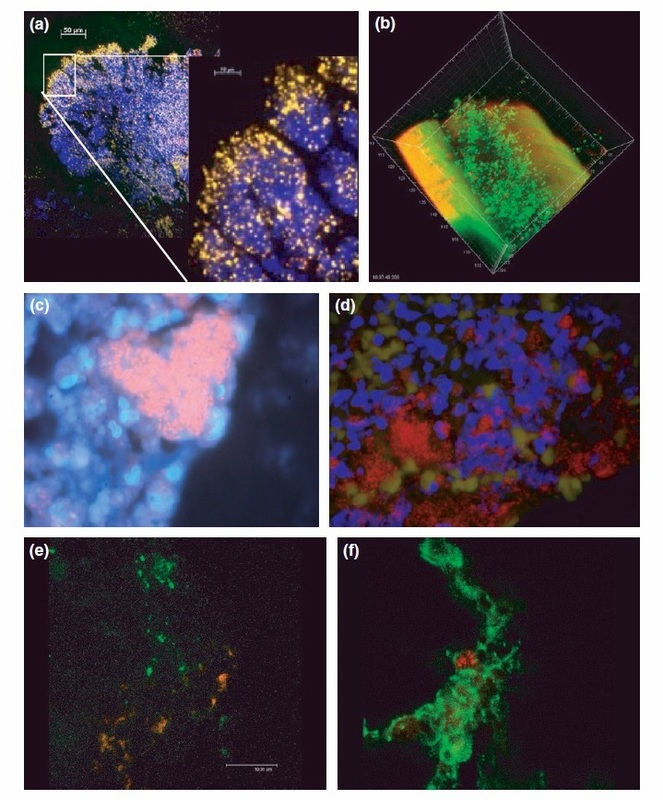 Chronic wound and P. aeruginosa (Bjarnsholt et al., 2009a) FEMS Immunology & Medical Microbiology, Jul2012, Vol. 65 Issue 2, page 135. Could biofilms play a role in the many cases of Lyme disease that aren’t easily cured by antibiotics? Annie Courtens explores such cases in her story, No Silver Bullet: The Many Protocols to Healing Lyme . According to the Centers for Disease Control, 300,000 Americans suffer from Lyme disease annually, which is caused by the bacteria, Borrelia burgdorferi. Bacteria such as Borrelia can alter their shape and size in response to environmental conditions, says University of New Haven molecular biologist Eva Sapi, with Borrelia morphing into at least seven different forms, including cysts and granular forms. The spiral shape that the bacteria is known for can morph into these specialized forms inside the biofilm community. Sapi describes in an intriguing online video interview how she started out as a cancer researcher at Yale University, but switched to studying Lyme when she contracted the disease in 2011. 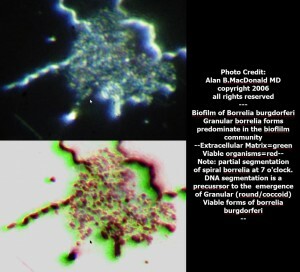 In a 2012 study, Sapi and MacDonald, along with other collaborators, showed that Borrelia burgdorferi formed biofilms under laboratory conditions. Their research was published in a 2012 Public Library of Science paper. Their attempts to publish their paper were delayed for 6 years, with reviewers demanding ever increasing levels of proof for Borrelia biofilms. The paper was finally published in November 2012 in PLoS ONE. While much remains to be learned about biofilms, a more relevant question for patients might be: what can we do to get rid of them? Paradoxically, the very act of trying to treat a bacterial infection with antibiotics, for example, might cause bacteria that are “planktonic,” or floating, to form biofilms, making them much more difficult to treat, says Sapi. One idea, suggested by SUNY New Paltz biofilm expert Megan Ferguson, is to use microbes such as Bdellovibrio bacteriovorus, which is a bacterium that preys on other bacterium and then propagates itself. It destroys dangerous biofilms by invading the gram-negative bacteria that make them up (Borrelia are gram-negative) and then, after lysing (or popping) the cell, it invades the close-by neighbors that make up the biofilm. Related research is ongoing. It seems that science has started to nail these little communities of microbe pathogens. There is still much more research to do. According to Costerton, scientific research is advanced by interesting discoveries that excite people. Perhaps when enough people are excited at the prospect of finally solving the riddle of chronic Lyme disease and other infections, we will have an opportunity to cure chronic antibiotic-resistant forms of this disease and other chronic infections, too. correction: Biologist Eva Sapi contracted Lyme disease in 2002, a year after moving to New Haven. What an interesting concept! In some of the photos, the biofilms resemble outer space. This article stresses once again the need to keep our immune systems strong and healthy.